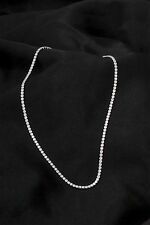 Solid 925 Sterling Silver 'tennis Style' Necklace With Simulated Diamonds (cubic zirconia) not cultured diamonds (2.5mm wide) A thin realistic strand of stunning sparkly simulated diamonds. 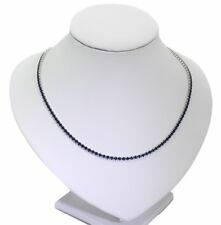 Solid 925 Sterling Silver, Riviera Tennis Necklace with Simulated Diamonds 2.5mm. Solid 925 Sterling Silver 'tennis Style' Necklace With Simulated Diamonds (cubic zirconia) not cultured diamonds (2.5mm wide) A thin realistic strand of stunning sparkly simulated diamonds. Importing goods that she had admired from around the globe. Sparkling eye catching tennis necklace, in lab created sapphires. Importing goods that she had admired from around the globe. Hence (Karianne’s Secret). Established in 2015 by Karen, Mum to Arianne. · Remove Your Jewellery Before Bathing - Remove all jewellery before showering or cleaning. Soap can cause a film to form, making it appear dull and dingy. Shape of stone - Pear. White gold Filled is not like plated Jewellery. 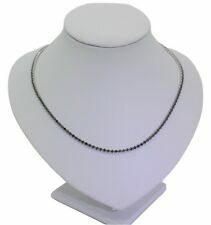 Style: TennisLength: 16 - 17.99"
Sterling Silver 'tennis Style' Necklace With Lab Created onyx (2.5mm wide). Shape of stone - Pear. White gold Filled is not like plated Jewellery. It uses only the best quality 10 karat white gold beads for this process. It is also known as rolled gold Jewellery. Essentially it looks like solid white gold; it feels like solid white gold. Shape of stone - Pear. Type of stone - Ruby (Simulated). White gold Filled is not like plated Jewellery. It uses only the best quality 10 karat white gold beads for this process. It is also known as rolled gold Jewellery. Metal: White Gold FilledStyle: TennisLength: 16 - 17.99"
Lovely retro inspired tennis style with floral links. Elegant solid silver necklace/choker. Collection station availableMetal: Sterling SilverStyle: TennisLength: 16 - 17.99"
94 stones with the equivalent of 23.5 carats. This has a 3 prong setting to ensure it bends beautifully and will sit facing forward. Importing goods that she had admired from around the globe. Hence (Karianne’s Secret). Shape of stone - Pear. Type of stone - Yellow Sapphire (Simulated). White gold Filled is not like plated Jewellery. It uses only the best quality 10 karat white gold beads for this process. It is also known as rolled gold Jewellery. 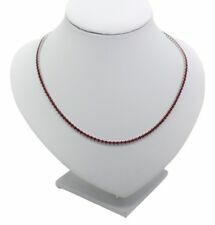 Sterling Silver Riviera, Tennis Necklace With Sparkling Simulated Rubies (2.5mm). 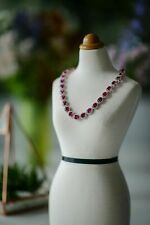 Sterling Silver ‘tennis Style’ Necklace With Simulated Rubies (2.5mm wide) A thin realistic strand of stunning sparkly lab created diamonds. Importing goods that she had admired from around the globe. Hence (Karianne’s Secret). Established in 2015 by Karen, Mum to Arianne. Sterling Silver Riviera, Tennis Necklace With Sparkling Simulated Gold Diamonds (2.5mm). Karianne’s secret CTN1GD. Importing goods that she had admired from around the globe. Hence (Karianne’s Secret). The necklace weighs approx 43g. Metal: Sterling SilverStyle: TennisLength: 16 - 17.99"
Cubic Zirconias Stones. Length 17". · Remove Your Jewellery Before Bathing - Remove all jewellery before showering or cleaning. Soap can cause a film to form, making it appear dull and dingy. The overlay is then plated with a very thin electro plate of silver. Metal: Platinum PlatedStyle: TennisLength: 16 - 17.99"
Hallmarked 18ct white gold London (VS). Stunning Diamond Necklace, 17.31ct of Natural Diamonds, Diamonds are G/H in colour, Si1 clarity. Est. delivery dateEst. 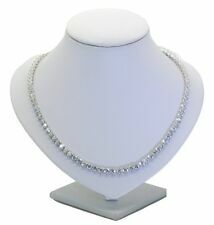 delivery Fri, Apr 26Metal: Sterling SilverStyle: TennisLength: 16 - 17.99"
Sterling Silver 'tennis Style' Necklace With Lab Created chocolate diamonds, (zirconia ) (2.5mm wide) A thin realistic strand of stunning sparkly lab created chocolate diamonds. Importing goods that she had admired from around the globe. The necklace weighs approx 15.4 carats / 21g. In addition, ten diamond set round links finish off the necklace. The necklace has a total weight of 40.50 grams and is completed with a fish hook necklace lock. An independent jeweller's certificate is provided with this necklace, with a valuation of £8,000. Length 16" and it is almost 17" with the extender, the focal drop is 6.6cm in length in the center and the lemon stones are 6mm in size and the smaller cubic stones are a little over 1mm in size. The necklace weighs approx 25g / 15 carats. The necklace weighs approx 27g / 14.4 carats. 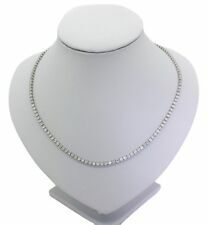 Platinum Sterling Silver White Sapphire Bezel Set Design Halo Tennis Necklace. 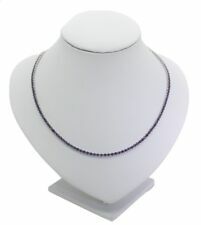 THIS IS TRULY A MUST HAVE DESIGNER PLATINUM STERLING SILVER WHITE SAPPHIRE TENNIS NECKLACE FOR ALL OCCASIONS. MADE WITH PLATINUM OVER STERLING SILVER (.925) GET THE DESIGNER LOOK WITHOUT TH E EXPENSIVE PRICE T AG! 18K White Gold Round Diamond Oval Ruby Tennis Necklace. 18k white gold necklace weighs 41.1g. 58 oval rubies, total weight 43.50ct. Style Tennis. Total weight on the necklace is44.66ct. Necklace is 17.5" long. Platinum Sterling Silver White Sapphire Princess Channel Set Tennis Necklace 16"
THIS IS TRULY A MUST HAVE DESIGNER PLATINUM STERLING SILVER WHITE SAPPHIRE PRINCESS CUT STONE CHANNEL SET DESIGN TENNIS NECKLACE FOR ALL OCCASIONS. MADE WITH PLATINUM OVER STERLING SILVER (.925) GET THE DESIGNER LOOK WITHOUT TH E EXPENSIVE PRICE T AG! (5) Color Stones (White Topaz, Pink Sapphire, etc.). Want to add your personal touch to this piece?. Most customization requests include 1) Ring Resizing. “BRAND NEW - Extremely Rare World Class 24.55 Carat Natural Green Emerald & Diamond Engagement Cocktail Tennis Necklace. Please note that this rare gemstone specimen offers a stunning SOLID Green Color, making this one of the most collectable of all Emeralds given its fine vivid Green color. This one of a kind 23.00 carat (Exact Carat Weight) Natural Emeralds are elegantly accented with a generous top quality near flawless VS clarity and H~I color diamonds totaling a whopping 1.55 carats in a spectacular classic design. The heavy SOLID 14k Yellow Gold setting is a mouth-watering world class jewelry delight. This necklace has everything you would expect from a "Top Gem" collector's grade masterpiece and would be the flagship of any high end extra fine jewelry collection. Don't let this immaculate beauty get away. (5) Color Stones (White Topaz, Pink Sapphire, etc.). Want to add your personal touch to this piece?. Most customization requests include 1) Ring Resizing. 7) Anything under the sun that catches your fancy, we will give it a try :). (5) Color Stones (White Topaz, Pink Sapphire, etc.). Want to add your personal touch to this piece?. Most customization requests include 1) Ring Resizing. Shri shti Jew els. This is an Estate Oval Blue Ceylon Sapphire & Diamond Necklace. It has a CTW of 6.50Ct and weighs 51.0 grams. The fancy diamonds have a clarity of VS2 and F color. This beautiful custom piece has excellent oval cut blue Ceylon sapphire gemstones that travel all the way up this necklace with diamonds travelling all the way up. Free Custom Ring Sizes. We will try our absolute best to resolve any problems that you may have. We will try our absolute best to resolve any problems that you may have. Free Custom Ring Sizes. All our products are of high quality and jewelry at reasonable prices. As we buy in bulk and have our own Factory so it makes you save around 75%. We will try our absolute best to resolve any problems that you may have. Beautiful Blue Topaz Tennis Necklace. 64 0.50 carat Blue Topaz Stones Set in 14k Yellow Gold. Style Tennis. Total Carat Weight: 32.00 carats. Main Stone Topaz. Total Carat Weight (TCW) 32. Total Carat Weight 32.